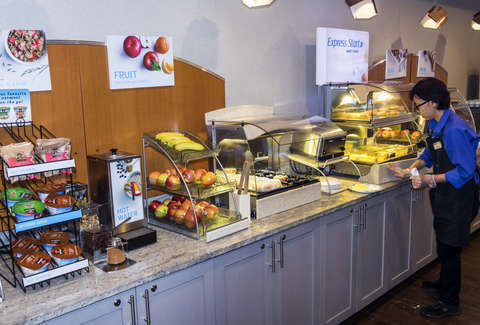 Guard your waffles, mediocre hotel breakfast buffets, there’s a breakfast bandit on the loose. Police in Dalton, Georgia are in hot pursuit of a hungry man accused of terrorizing family-style platters of once-frozen sausages and off-brand corn flakes at budget hotels across town. He’s like the breakfast sausage rendition of the Hamburglar -- only worse, because he’s real. And your malted waffle could be next. The low-stakes criminal reportedly told a Holiday Inn Express employee that he was “just checking how easy it is to get into hotels and get free stuff.” He was spotted wandering into locations across Dalton, pocketing bottles, towels, and plastic silverware, before demolishing the most holy of all hotel accomodations: the breakfast buffet. We’re talking pancakes, bacon, Cocoa Puffs, the whole charade. “I think he knew this hotel is known for its breakfast,” the front office manager at the very same victimized Holiday Inn Express told WRCBtv news last week -- which was not an unsubtle plug for the hotel at all, but rather, important intel for the stumped policemen currently on the job. Within that same week, the perpetrator was allegedly spotted wandering the halls of a local Super8 and a Quality Inn in search of airline-sized body wash to pair with his slyly swiped scrambled eggs. Fortunately, the Hardy Boys of breakfast have captured a photo of the perp, which they posted online along with a helpful general reminder to the public that “the complimentary breakfast buffet is only complimentary if you're a hotel guest.” Not all heroes wear capes. Eliza Dumais is actually the breakfast bandit. Follow her on Twitter.